A sandstone-framed parterre garden and beautiful 18th-century doorway create a welcoming first impression in this beautiful French-villa inspired family home. 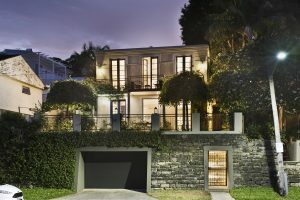 Built on the site of a 19th-century fisherman’s cottage, 109 Mort Street, Balmain overlooks the lush expanse of historic Mort Bay Park with northerly views out over the harbour creating a captivating ambiance by night. The sandstone blocks and retaining wall were salvaged from the original cottage and now serve as a nod to the home’s heritage while anchoring the property firmly in the present. Classical contemporary interiors radiate timeless elegance with a beautiful antique French door and entry portico providing a gracious entry to the home. A seamless flow from sun-drenched interiors to a north facing garden with views across to the iconic Harbour Bridge creates a perfect environment for family living and entertaining with a custom island kitchen and dining area opening outdoors through a series of French doors. The interplay between indoor and outdoor living spaces underlines a feeling of openness and sanctuary reminiscent of a private retreat on the French Riviera with a pair of mulberry trees framing the gardens and bearing delicious purple berries during spring. Accommodation comprises four double bedrooms, three on the upper level with built-in robes including a luxurious master with a sun-washed balcony overlooking the harbour. An Italian travertine ensuite with a French antique marble-topped double vanity opens out to the balcony and features a freestanding bath and frameless glass shower. 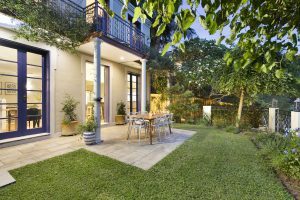 Additional features include a library gallery, Juliet balconies, reclaimed Ironbark floors, an open fireplace, travertine family bathroom, powder room, ducted air conditioning and internal access to a double lock-up garage with wine cellar. Leafy Mort Street is one of the peninsula’s dress-circle addresses with Mort Bay Park and Thames Street Wharf at the doorstep. 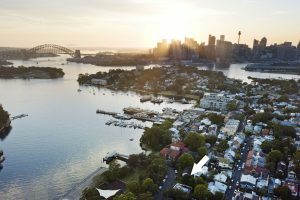 Jump on the ferry for an easy 10-minute commute to the city or stroll to the cosmopolitan heart of Balmain village and its celebrated cafe and dining scene. The Federal election; Negative gearing and capital gains tax. Are we being misinformed? DARING TO BE DIFFERENT. IT’S YOUR MOVE. WestConnex – how will it affect our local community? OUR SOLD STICKERS. OUR COMMUNITY.